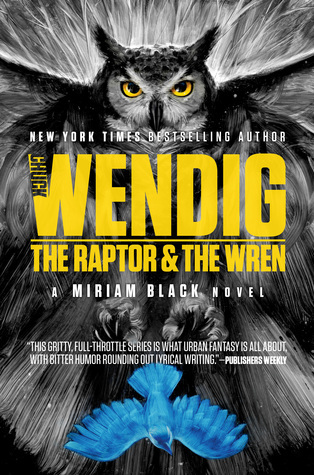 Of all of Wendig’s books that I’ve read, his Miriam Black series is by far my favorite. While the last volume wasn’t as good as the previous three, this next installment seems to indicate a return to the gritty, violent and horror-filled darkness that made me love the earlier books so much. I guess we’ll just have to wait and see what happens. “In the fifth book of the “wildly entertaining” (Kirkus Reviews) Miriam Black series, Miriam continues her journey to find answers on how to change her fate and begin to make right some of what she’s done wrong. Oooh interesting! That’s a totally new to me one! Hope you love it! I hope so! The series is best when it is at its darkest 🙂 I thought Thunderbird was actually on the tamer side, lol! OMG I need this series for that cover alone. Awesome pick and the darker the better for me! Yeah, I didn’t love the last book (still haven’t reviewed it and probably won’t now), it just seemed to lose something for me, the grittiness – I don’t know, it had a filler kind of feel and it just didn’t generate the same excitement in me as the others – but, even so, I”m fully bought into this series now and need to know what happens next. I agree the last book was the weakest link and I couldn’t really pin down why either. It didn’t quite hook me like the previous installments. Same here, I think I will at least finish the series. I think there are a couple more books and then he’s done. Wow, book 5 already. I really want to read this series. Miriam Black always sounds pretty awesome. I find the “author’s name bigger than the title” thing hilarious too, especially for this series! I so much prefer the style of the original covers for the first three books. What a great cover! I love that! Hope the book is as good as it looks!